Climate change could have a "huge impact" on China, reducing crop yields and harming the environment, the country's top weather scientist has warned, in a rare official admission. Zheng Guogang told Xinhua news agency that climate change could be a "serious threat" to big infrastructure projects. China, the world's biggest polluter, has said its emissions of gases that cause climate change will peak by 2030. However, the country has not set a specific target for cutting emissions of the gases, mainly carbon dioxide. 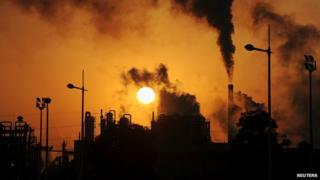 Mr Zheng, the head of China's meteorological administration, said warming temperatures exposed his country to a growing "risk of climate change and climate disasters". These are rare admissions from a Chinese official, BBC Asia analyst Michael Bristow says. China's leaders have acknowledged the damage from global warming but they usually do not lay out the full scale of the problems. "To face the challenges from past and future climate change, we must respect nature and live in harmony with it," the Xinhua news agency quoted him as saying. "We must promote the idea of nature and emphasise climate security." China's decades-long pursuit of rapid economic growth has boosted demand for energy, particularly coal. Scientists fear that pledges made so far to cut emissions will not be enough to avoid the harmful impact of climate change.